The 227th meeting of the American Astronomical Society kicks off tomorrow. This year, the meeting is taking place in Kissimmee, Florida. There will be hundreds of talks and posters during the conference, covering every subfield of astronomy; an abbreviated schedule can be found here. Good news: several Astrobites authors are here, and we’ll be blogging the meeting all week! We’ll put up a post at the end of each day with summaries of a selection of events from the meeting. Want real-time updates instead? 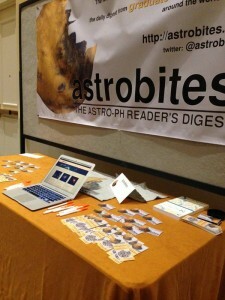 We’ll also be posting live to Twitter, so follow us (@astrobites) to find out the latest news, 140 characters at a time! Well-stocked astrobites booth at the undergrad orientation at AAS 227. You may have already seen us at the undergraduate orientation this evening, where we were handing out swag and giving live demos of the site. Finally, the following Astrobiters will be giving presentations at the conference. If you see them, stop them and say hello! Their presentations are below, ordered chronologically. Warm Circumstellar Debris Disks: Dynamical Excitation by Massive External Perturbers?